These fishing rights owned by the Association are quite possibly one of the best stretches of the River Trent available. Chub, Barbel and Roach make up the majority of catches on this very popular water. 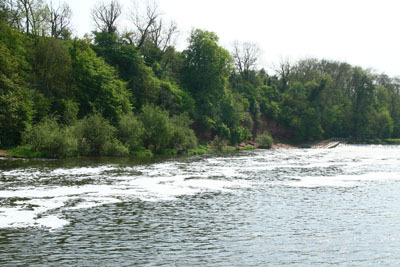 The fishing rights start directly below the weir at Gunthorpe and continue downstream for approximately 1½ miles. The first ¾ mile is at the bottom of a heavily wooded bank offering some protection from the elements and presenting a very picturesque scene, this then opens out into flat meadows for the remainder of the stretch. The main access point is a large car park ½ mile downstream of the weir. The riverbank in the car park is quite steep, however a short distance both upstream and downstream the banks are considerably better. This water is now Strictly members only. Night Fishing is allowed with a Night Fishing Permit and from the Weir to the fence in the Car Park only. Closed Season 15th March to 15th June inclusive. Please Note that a gate has been installed close to the bottom of the track. This requires a N.A.A. key. From Lowdham Roundabout take the A6097 towards Gunthorpe Bridge and just after the bridge turn left into Trent Lane. Continue for ¾ mile to the crossroads in East Bridgford Village and turn left into Kneeton Road. Continue for another ¾ mile looking for a left turn into a Public Bridleway (this is known as Old Hill Lane) continue along this track and down the hill past the car park on the right for a total of ½ mile into the car park in the wood. Under no circumstances must cars be taken upstream or downstream from the car park.